The main challenge for the campaign team was ensuring that Sanpellegrino's brand messaging shined through. To help celebrate the launch of its new travel-centric mobile app, Sanpellegrino provided a series of free bike share weekends in New York, Chicago, and San Francisco over the summer. The Italian beverage purveyor was looking for ways to promote Delightways, which hit mobile app stores on June 16. 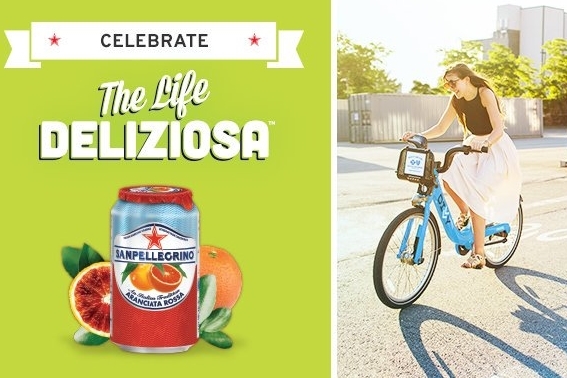 The free bike share weekends across three major cities in the U.S. tied into Sanpellegrino’s overarching The Life Deliziosa campaign. Delightways is an interactive app which helps locals and visitors alike to explore cities while discovering unique places to visit and cool things to do along the way. Partnering with Foursquare and local businesses, the app curates thousands of local attractions. For this campaign, Sanpellegrino teamed up with Motivate, which formed in 2014 and is the largest bike share system in North America. The Delightways campaign became the first multi-city bike share campaign executed via Motivate's unique model. In late 2015, Sanpellegrino’s agency Epsilon approached Motivate after seeing a campaign between Citi Bike and Bai Antioxidant Infusions which included a bike-in movie night in New York, and Bai sampling events at Citi Bike stations. Sanpellegrino was launching Delightways in Atlanta, New York, Los Angeles, Chicago, San Francisco, Miami, Austin, Seattle, Boston, and Washington, D.C. Motivate has bike share systems in five of these cities with large membership bases. In early 2016, Motivate and Sanpellegrino decided to focus on New York, Chicago, and San Francisco for the campaign. The main challenge, from the campaign team's perspective, was to ensure that Sanpellegrino’s brand messaging would shine through. Each of Motivate's bike share systems have their own branding and name, Citi Bike in New York, BABS in the Bay Area, and Divvy in Chicago. The strategy was to build an integrated platform that would share the story of Sanpellegrino Sparkling Fruit Beverages and encourage consumers to live "The Life Deliziosa," which is all about wandering and exploring your city. With main goals of driving downloads of the app and promoting consumer engagement, the campaign team wanted to reach the widest possible audience, offering multiple touch-points so that consumers would see Sanpellegrino branding and messaging multiple times. The campaign team decided to go after two specific tiers of media to spread publicity about the campaign. "On one hand, we wanted to get out very broadly in New York, Chicago, and the Bay area, going after daily publications and lifestyle outlets," explained Dani Simons, head of the Motivate communications team. "On the other side, we were interested in spreading awareness of the campaign and the partnership in the trade press." In order to ensure that people knew about the free ride day, the campaign team pitched daily and weekly publications in the three cities, including: The New York Times, Gothamist, Chicagoist, Chicago Tribune, and local innovation and transit outlets. Motivate's PR team developed the branded campaign website, paid ad strategy, and email blast strategy. BerlinRosen helped out with press releases and pitching the campaign to media outlets. The team sent email blasts to Motivate's current members and prospect lists asking them to invite their friends to ride for free. Paid third party email lists in New York and Chicago were also sourced for email prospects. Epsilon provided creative input for this campaign, crafting the stickers that went on the bike docks, and outdoor advertising. The PR team had a concerted push on social media leading up to and during the free ride weekends, using a combination of paid and free Facebook ads, as well as tweets through branded Sanpellegrino and Motivate channels. "I think brands and sponsors are recognizing the value of the unique media of bike share," said Simons. "You get the outdoor exposure, but you also get a richer service connection of helping bike share members in a way that helps them with their everyday lives." The Delightways campaign saw coverage in several top-tier outlets, such as The New York Times, Chicago-Sun Times, NY1, and amNY. Overall, the campaign generated nearly 300 million media impressions across both social and traditional channels for Sanpellegrino. The total number of bike trips at bike share stations while ads were installed was 528,248, with the vast majority coming from the New York leg of the activation.